Relief? Comfort? Not usually part of the protocol. But even now, there are times when doctors must agree that cure is no longer possible, and that the best possible care is to offer comfort to the patient and their family. That is where hospice comes in. The goal of hospice is to remove as much fear and pain as possible from the dying process. 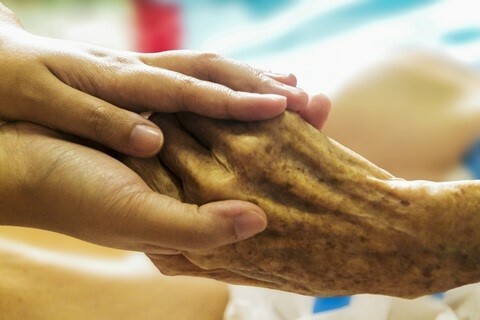 When it is agreed that the patient’s condition is terminal, that the prognosis is no more than six months, and that treatment will no longer prolong life, hospice offers the best care possible: care whose goal is to treat the pain and distress of the patient (and their family), whether that distress is physical, emotional, or spiritual. A team of doctors, nurses, counselors, social workers, and, if desired, chaplains, work with hospice patients and their families to make the patient’s remaining days more comfortable. Although therapies intended to cure are halted, if a therapy — such as physical, occupational, or speech therapy — has the effect of improving the patient’s quality of life, it is provided. Hospice care extends even beyond the patient’s passing; it includes bereavement counseling for the family. To cure is an admirable goal, but it is not always possible. To care is also an admirable goal. And it has the added benefit of always being possible. At Laurel Bay Health and Rehabilitation Center, in the scenic beach town of Keansburg, NJ, we are uniquely qualified to care for the needs of seniors — including their needs and the needs of their families, at the end of life. In addition to hospice care, Laurel Bay offers long-term care, rehabilitative care, short-term rehab, and respite care for those times when family members just need a break. a person to be treated with compassion, dedication, respect, and care for.